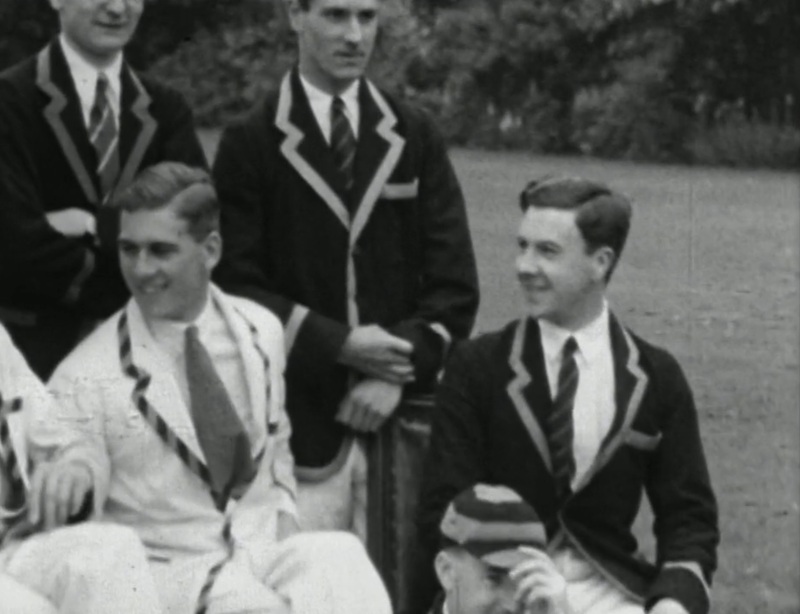 In an exciting development for the College Archive, a 30 minute cine film showing student life in Downing and Cambridge between 1928 and 1930 has recently been made publicly available via the University’s Media Streaming Service. The film was made by Downing student Henry Iliffe Cozens, an RAF officer who gained his wings in 1924 and matriculated at Downing in November 1928 studying Mechanical Sciences. He was an active member of College, rowing in the second and first Downing boats during his two years at Downing. He graduated in 1930 after being awarded 3 extra terms on account of his military status. After leaving Downing, Cozens had a long and fascinating life. After graduating, he was seconded to the British Arctic Air Route Expedition (1930-1931) as official photographer and film-maker. A copy of his film of the expedition, Northern Lights, was shown commercially in the West End after the end of the expedition and is now held by the Scott Polar Research Institute. Cozens was awarded the Polar Medal (Silver) for his film. (Cozens’ photographs from the expedition have recently been digitised as part of the SPRI’s Freeze Frame project and are now available online here). On his return to the UK, Cozens joined the No. 25 Squadron as a fighter pilot. After service in Iraq, he was appointed Commanding Officer of 19 Squadron in 1938, the first squadron to fly Spitfires operationally. He was later awarded the Air Force Cross in recognition of his role in introducing the Spitfire into Fighter Command’s front line. Cozens himself continued to fly bombing raids during the Second World War up to 1944, when a direct order forbidding station commanders flying operationally prevented his further active participation. He continued pursuing his interest in film-making, making an important training film, Night Bombers, in 1944 which chronicled a raid over Germany by Lancaster bombers. He retired in 1956 as Deputy Chief of Staff (Air Training). Shortly before his death in June 1995, Air Commodore Cozens’ film of his ‘Cambridge Days’ was donated to Downing College. It has recently been digitized by the East Anglian Film Archive. The film provides an unusual and fascinating insight into student life in Downing and Cambridge between 1928 and 1930, including general Cambridge scenes showing the Senate House processions, Rag Week, Bumps on the Cam and May Balls, plus rare scenes of ice-skating on the frozen Cam. More interestingly, from a Downing perspective, the film includes scenes of the Domus before the building of Baker’s North Range, (as yet unidentified) staff and Fellows and the College’s first organ in its original home in the Hall, twenty years before the building of the Chapel. The film has now been made publicly available online for the first time via the University’s Media Streaming Service. It is a fascinating addition to the College’s archive, showing what Cambridge was like for a student at the time, but also providing an insight, for the very first time, into real life and individual characters in Downing College at this time, a heart-warming snapshot of history and tradition but also, more unusually, friendships and leisure time for Downing students eighty-five years ago. Download an information sheet on Air Commodore Iliffe Cozens and his film of Downing life. Obituary in Polar Record, Vol. 31, Issue 179, October 1995, p441-2. Biographical article written by Air Commodore Cozens’ daughter on the Family Tree Forum. Stills from the Cozens film ©Downing College.